For many years Clara and I have talked about hiking up Guadalupe Peak and camping out for one night on the mountain. We really thought that it would be the thing to do. We never seemed get around to doing it or even checking on what it involved. We were planning a week long trip to West Texas in October. The plan was to visit Clara's parents, see our old friends and generally relax. We thought about driving down to Fort Davis and spend a couple of nights at Indian Lodge. Then Clara came up with idea that we climb Guadalupe Peak. There goes our relaxing vacation. After doing a little research we learned that we really didn't want to camp out on the mountain and that we should be able to make the whole round trip in one day. 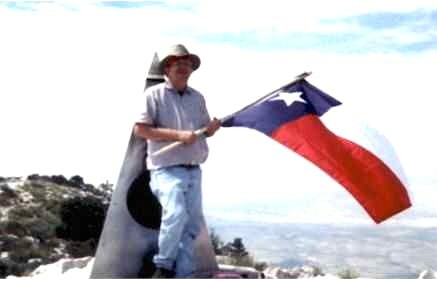 Guadalupe Peak is the highest point in Texas at 8749 feet (2667 meters) and is located in the Guadalupe Mountains National Park. The park is located in Culberson County and is about 100 miles northwest of Pecos, Texas, by way of Orla, Texas. The closest place to stay is White City, New Mexico. It's just 37 miles away from the Guadalupe Peak trail head. The only problem with White City is that it is located at the entrance of the Carlsbad Caverns National Park and is listed "near the top" in the top ten tourist traps in America. So the best bet for overnight comfortable lodging and you'll need it if you climb the "Guadalupe", is Carlsbad, New Mexico a scant 60 miles from the park. The trail it self is 4.2 miles up, and 4.2 miles down. I have to admit prior to this adventure I had never walked 8.4 miles on flat ground. Once when I was about 12 I walked from my house on the West Side of Odessa to FM 1936 and back, that was about 6 miles. I remember how hard it had been. But then again I was 12 years old. Now at 47 Clara and I were going to hike 4.2 miles up, and 4.2 miles down. Another thing that had me wondering about the sanity of the trip was that on the "Official" map and guide, it listed the Guadalupe Peak trail as "Strenuous, 3000 feet elevation gain". Strenuous, what did that really mean? 3000 feet elevation gain, What did that mean? Never being a math whiz I surmised that 3000 feet was the equivalent to climbing to the top of a 30 story building. That seemed bite size to me. I envisioned myself climbing up the stairwell of a 30 story building. Given enough time, I could do that. Later, about one fourth of the way up, I realized the error in my over simplistic "30 Story" building analogy. It wasn't 30 stories but 300 stories. And that nice evenly stepped stair well? I hadn't envisioned it being covered with rocks! We did make some preparation for this trip. We shopped for the right hiking boots. Looked at day packs, discussed what we would need to take with us, how much water to carry etc. We even talked about walking around the neighborhood in the evenings after work to get in better shape. We did all of that … except the walking part. It was just too hot in Houston, Texas to get out walking. About a week before we left for West Texas Clara came to me and said, "We should go walking today." And I said, "It's too late to start walking now. We need to save our strength for the hike." We left Midland, Texas about 8:00 a.m. on a Tuesday morning going toward Guadalupe Mountains National Park. The trip was only about 190 miles and we had all day to arrive there. Passing through Odessa we were headed west on US 302. About 10:30 a.m. we arrived in Kermit, Texas. After looking around town for a few minutes we decided to stop for "brunch". I had spotted a place called "302 Highway Restaurant". It had catchy slogan on the sign that said, "Where good food … is never accidental". We went in and ordered a couple of breakfast burritos. This place had a large dining room but we were the only customers. A little suspicious? Yes, but the burritos were good and I'm sure Kermit doesn't have an animal control problem. The	next stop on our West Texas trek was Mentone, Texas. This is the county seat Loving County, the least populated county in the United States. With a population of about 68 (2002 est.) it has no schools, no newspaper, and no lawyers. Except for having to haul in all the water you need, it wouldn't be a bad place to live. From Mentone we traveled to Orla. A little smaller than Mentone it's the only place I know where the buzzards carry canteens. We stopped for a cold Dr. Pepper at the Orla grocery. Outside the store is a sign that reads, "It's a long way … to any where from … Orla Grocery", and it is. In Orla we turn west on Texas 652. On the map this may appear to be a very minor road, but it is a good two lane highway. In Louisiana it would be a super highway and they would probably charge a toll. This is the beginning of real moonscape territory. It is very desolate and dry. Depending on the weather you can begin seeing the Guadalupe Mountains from here. About 40 miles later Texas 652 intersects with US 180. This is a major highway between Carlsbad and El Paso, Texas. Here we turn west for the final 20 miles to the Guadalupe Mountains National Park. After arriving at the park, the first place we went was to the visitors center at Pine Springs. There we chatted with the park ranger, pick up a few post cards, and examined a three dimensional model of Guadalupe Peak and the trail going up. The trail looked "Strenuous", but I was still clinging to my "30 story building" analogy at this time. The ranger was encouraging and said the key was to take our time and enjoy the mountain. We accidentally did what would turn out to be a couple of smart things before we made our "ascent" of the mountain. We wouldn't realize just how smart this was until the next day when we were on the mountain. The first smart "accident" happened here at the visitors center. 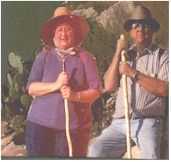 Clara and I had both brought walking sticks with us from Midland. It was just a last minute thought. The problem was they were both short, at least for me anyway. I had already decided not to take one because they didn't fit me. At the visitors center they had, for sale, walking sticks in three lengths made from "sotol" stalks. They were strong and light weight. I never thought I would pay money for a stick but I did and it was a life saver. Besides I reasoned, if you dropped dead on the mountain they could bind your hands and feet, slip the stick through them and carry your body out. After leaving the visitors center we decided to take the "get in shape" walk we had been putting off. From the visitors center we took the "Pinery Trail" to the ruins of a Butterfield Trail stagecoach station. It was a short hike but I have to admit I was a little winded when we got back to our truck. I pulled out the "Official" map and guide and read about the Pinery Trail. "0.75 miles round trip, Rated: Easy, wheelchair accessible. That evening we check into a nondescript Holiday Inn in Carlsbad, New Mexico. With little to do until the next day we went for "supplies", a trip to Wal-Mart was in order. There we bought a couple of disposable cameras, bottled water, and snack food. It was here we made our second smart "accident", we bought two red bandanas. Then it was back to our room for a good nights sleep. We arrived at the trail head at 7:00 am MSDT (Mountain Daylight Savings Time). We weighed our packs, 12 pounds each, and signed the trail log book. We started up the trail with me in the lead. I would walk 20 yards and then wait for Clara. After about 200 yards, I put Clara in the lead and this is the way we went the rest of the hike. We broke no speed records on this hike. We stopped often, very often, both to enjoy the mountain and the view and to rest. The "Official" map and guide said the hike should take between 6 and 10 hours and I expected to take every bit of it. The weather was ideal. The temperature for the day ranged between 70F and 82F. The most amazing thing about the weather was the lack of wind. The Guadalupe Mountains jut out into the desert floor and stand high above (3000 feet) the surrounding terrain. This area is notorious for its high winds. The winds get so high here that US 180, the highway that cuts around the mountains, has wind socks all along the area as a warning for high profile vehicles. But on this day there was hardly a breeze. It was cool enough that we were both wearing two shirts. We both wore jeans, a hat and carried day packs. I was wearing a pair of light weight hiking boots and after all the preparation and shopping for the right footwear, Clara had decided to wear a pair of old Nike Airs. I have to say we looked the part. The trail going to the top of Guadalupe Peak actually ascends a series of mountains. The first mile and a half go up the mountain that is visible from the trail head parking lot. It does this through a series of switch backs. After about two and one half hours we could still see our truck in the parking lot far below us. It was at this point that we rounded the first mountain and lost all site of civilization. This area was also different in that we had been hiking in a "desert" area and suddenly we were hiking in the shade of massive pine trees. All the mountain peaks we could see towering above us reminded us that the Guadalupe Peak had to be higher, because it was the tallest in Texas. Early in our hike we wet our bandanas and tied them around our heads, Willie Nelson style. The wet bandanas felt like ice when we placed them on our heads. After living in the humidity of Houston for the past seven years we had forgotten the pleasures of the dry desert air. Even though the weather was moderate, climbing the trail was hot work. We would occasionally stop, unwrap our bandanas, shake them out, and put them back on our heads. Each time the high evaporation rate would create a cool refreshment of ice on our heads. About three hours into the hike we stopped for a few minutes to eat a light snack. We weren't really hungry but we knew we needed to eat. We had also made ourselves drink lots of water. We had set a comfortable if not slow pace. We were confident that we would make it to the top. After our break we continued on. An hour later we came to the cut off for the Guadalupe Peak campsite. This was an important spot because for the first time in hours we had some concept of how much further we had to go to reach the summit. We knew that we had another mile to go to the top. As in most climbs the last mile was the toughest. Shortly after leaving the campsite cutoff we left the shelter of the pine trees. We were above the tree line and back on a more southern side of the mountains and in the sun. Just before crossing over to the "Guadalupe" mountain we crossed a wooden bridge on the trail that traversed a deep ravine. I have no idea how they got that bridge up there. After the bridge we actually went down about 50 feet. This was the only down grade since we left the trail head. We regretted giving up any altitude we had worked so hard to get because we knew we would have to make it up in the end to get to the top. Crossing over to the "Guadalupe Mountain" we started up a series of about nine long switch backs before ducking into a short section of the trail protected from the sun by pine trees. It was here that we made some decisions. In true form of the climbers of Mount Everest we decided to lighten our loads by leaving some of our water on the rocks of this cool place to be retrieved on the way down. We were about to make our final assault on Guadalupe Peak. With a lighter load we left the cool protection of the pines and made trail up the bare rocks of the mountain. After a series of switch backs we came over the top of the spine of the ridge that runs from Guadalupe Peak down to El Capitan Peak. The view was spectacular! And a frightening drop off. To the right of us was the trail we had been climbing for the last hours and to the left was about a 2000 foot drop. On the horizon was the world. As spectacular as it was we still were not at the top. The much rockier, rougher, and harder to follow trail lay ahead of us and we moved on. The trail all but disappeared as we approached the summit of the peak. The last 50 yards was almost a hand and feet climb. Finally we were at the top. A silver stainless steel monument pointed skyward from the peak. The time was 1:20 p.m. MDST. The trip up had taken us 6 hours. I was so tired I wanted to lay down and rest but there was not a level place to be had. I had to satisfy my fatigue by sitting and leaning against the monument. While we rested I noticed a military ammo box. I opened it and it contained a log signed by all who had climbed the peak since July 1999. Clara and I signed the log book and read the comments others had made. One person had sketched a picture of someone leaning against the monument just as I was doing as I read. I reached for my pack and pulled out my Texas flag. With leather tongs I tied it to my walking stick. The winds were so calm the flag hardly lifted itself from the pole. We took a few minutes to take some pictures to record the historic event and for evidence to convince the non believers. No camera could ever capture the glorious view from the top. Before we left the summit I pulled my cell phone out of my pack just to see if I could get a call out. The signal was strong. Clara and I made a few calls to family. I joked with my brother David to send the helicopter to pick us up. That's when we suddenly came to the realization that we had walked until we couldn't walk any farther. Now we were going to have to walk 4.3 miles down. The first task to get down was to find the vague trail that got us the last 50 yards. With that done we started making trail. The walk down seemed to be much easier than going up. About 30 minutes down from the top we could see in the distance a young couple coming up the trail very fast. We had had the mountain to ourselves until now. They soon met us, we spoke a few words and they fired up the trail. Clara commented, "At the rate they are going to the top, I'll bet they beat us down." We reached the Guadalupe Peak campsite cut off a mile down from the top and I calculated that the last mile up had taken us two hours and the same distance down had only taken an hour. It looked like we were going to have an easy trip down. It wasn't long after that we both started having trouble with our feet. Clara had developed a blister. For me it was another problem. The constant down motion had caused the big toe on my right foot to be constantly slammed into the inside end of my boot. A minor annoyance, I started favoring my left foot. Then both toes began to hurt. Clara's blister hurt. We hobbled down the mountain. Going up was a piece of cake compared to going down. About 2 miles from the bottom the young couple passed us going down. We hobbled down the mountain. We finally reached the trail head and signed out at 8:00 p.m. MDST. We had been on the mountain 11 hours. We climbed into our truck and started the 60 mile drive back to Carlsbad. We were not hungry even though we had had little to eat that day. We went through the drive in window at Wendy's before we went back to our room. We knew we needed to eat something. We drove into the Holiday Inn and for the first time I realized we had an upstairs room in the middle. We had yet another peak to climb before we could rest. We survived and after a good rest and a few days to recover we would both do it again.